Amazon has tripled its seller base from close to 40,000 a year ago, Flipkart is hiring 10,000 temporary staff, and Snapdeal is offering collateral-free loans worth Rs 1,000 crore to its sellers â€“ a state of heightened activity is all too visible among Indian ecommerce companies ahead of the festive season that kicks in around October each year. The last quarter of each calendar year is crucial for most marketers in India but for ecommerce companies, specially the top three, this festive season is critical as it could change the course of the industry, and their position in it, for good. For Flipkart and Amazon, it's a fight for leadership and market-share while for Snapdeal, it is yet another opportunity to get its act together and stave off any possibilities of a forced merger. "This is going to be probably the most important season in the existence of ecommerce companies in India so far," says Arvind Singhal, chairman, Technopak Advisors, a retail consultancy. "Very clearly, the festive season will determine the leader and the followers," he adds. If Amazon, which has recorded higher sales than Flipkart in the past two months, manages to steal the march over its rival yet again during the festive season, it will have solidified its leadership in the market, say market experts, adding that if Snapdeal fails to turn around its fortunes in a significant manner, it may have no option but to seek refuge with one of its rivals. "If the Indian firms (Flipkart and Snapdeal) are not able to grow meaningfully and if they fail to contain losses, there will certainly be some markdowns. I wouldn't be surprised if the market witnesses a forced (by the investors) merger between Flipkart and Snapdeal in the next 12 months," says Singhal. This is a dire prognosis. And hence, the pressure on the companies for a water-tight strategy for a turnaround over the next three months. This festive season comes at a time when ecommerce sales, in general, have been on the decline in India. According to research firm RedSeer Consulting, ecommerce sales dropped 19% in three months ended March this year followed by another dip of 5-10% in the April to June period. The year 2016 has specially been tough for Flipkart and Snapdeal. The country's largest e-commerce company saw a series of markdowns this year and while two of its investors recently marked up the value of their stake in the company but at around $12 billion, its valuation still remains significantly lower than the last year's peak of $15.2 billion. Crunched for resources, Snapdeal has been in doldrums for quite some time now. The company shut down Exclusively.com, the marketplace for premium branded fashion and lifestyle products, about 18 months after acquiring the startup. Besides, it has also been in talks with several investors, including Foxconn, to sell a stake in its payments unit FreeCharge. Last month, VCCircle had also reported that Snapdeal had initiated preliminary talks with Flipkart and Amazon to explore a possible merger. The report, however, was denied by Snapdeal. Besides, according to a recent report by Mint, Snapdeal grossed sales of Rs 600 crore in July, which was a drop of 50% over its sales at the end of 2015. Meanwhile, Amazon has built a momentum as it scored a lead over the country's largest ecommerce company Flipkart in terms of sales in July and August. According to a report by Mint newspaper, Amazon India closed its sales a tad higher than Flipkart's Rs 2100 crore in August. The numbers, however, do not include the sales of Myntra and Jabong, the fashion portals owned by Flipkart. Amazon also claimed to have surpassed Flipkart as the most downloaded mobile app on Google and Apple stores in the first quarter of this year. 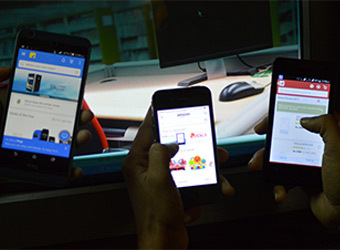 Moreover, a report from technology and market research firm Forrester's Consumer Technographics Asia Pacific Online Benchmark Survey for 2016 said that the Indian business of the world's largest e-commerce company had, for the first time since 2014, beaten Flipkart as the preferred online retail destination for consumers' in metropolitan areas. Given the heat, market pundits are expecting that Flipkart will leave no stone unturned to push sales. Speaking of plans for its Big Billion Day, the flagship annual sale held around Diwali, a spokesperson for Flipkart said: "Flipkart will offer deals which customers have not experienced before. Our deals will be better than any online or offline retailer in the country. We believe in expanding the market with initiatives meant to meet aspirations of Indians in every category. We have an increased focus on making quality products affordable to as many households as possible. Our specially designed no cost EMI, product exchange and basket discounts constructs will enable customers to buy a lot more with a smaller budget." Amazon is also likely to unleash aggressive sales plans over the next few weeks.Flushed with $5 billion committed by its deep-pocket parent, the Indian arm of the world's largest e-commerce company is also expected to fight back harder to widen the lead over the Indian rival. In an email response to Techcircle, the company said: "This will be the biggest, best and the most delightful shopping season ever for our customers across India. Customers should expect exciting new selection across hundreds of categories including the traditional festival favourites like large appliances, TVs, apparel, Home products, Kitchen products, Consumer Electronics, consumables, etc." Snapdeal, meanwhile, will be battling to retain the number three slot in the industry. In order to reignite its brand recall among customers, Snapdeal recently launched a rebranding initiative that included the unveiling of a new logo and a new advertising tagline "Unbox Zindagi". It also replaced its long-standing red and blue logo with a vermello-coloured box. "With this new positioning, we also focus on the next phase of our growth, as we seek to engage with the next 100 million online shoppers from all parts of an increasingly connected India," Kunal Bahl, co-founder and CEO, Snapdeal, said at the time of the launching the initiative. Singhal, however, says rebranding alone will not be able to help the company turn itself around. "I'm not really sure if the rebranding would give them any big boost if they are losing momentum. Rebranding is only one part of the exercise, the major aspects is the offers you are able to give your customers," he adds. To be sure, Snapdeal recently introduced a new service that promises free next-day delivery and other benefits to buyers who pay at the time of purchase. It also recently launched its own private cloud platform christened Snapdeal Cirrus which the firm hopes will help save costs and offer performance gains across its applications. A section of experts, however, feels these initiatives have proved that Bahal can still bring his company back on the track. "Kunal's plans are really ambitious. He needs to be appreciated for being the only person in the industry who has come out and spoken about assistive commerce and predictive commerce," says Sanchit Vir Gogia, chief analyst at Greyhound Research, a market research firm. Gogia adds that Snapdeal tried doing too many things in the past but now it seems to have a clear vision for the future. Meanwhile, Snapdeal says it is ready to make the best of the ensuing festive season. "This Diwali we expect a quantum jump in both our sales and in our net revenue - a logical outcome of Snapdeal being the most efficient marketplace in India, with the best unit economics," said a Snapdeal spokesperson, adding: "Based on our detailed data analytics, our sellers are stocking the required quantities of fast moving items in our 69 fulfillment centers across India from where we will ensure next day delivery to 104 cities across India." In the past, ecommerce sales in India have all been about discounts. Deep discounting, however, is a strategy companies, especially the homegrown players, can ill-afford this season. Their deep losses along side the regulation by the Indian government that bars ecommerce companies from artificially influencing prices of products sold on their platforms will require these companies to play with pricing in a manner that doesn't hurt them instead of brining any rewards. But this is easier said than done. The RedSeer Consulting report quoted above, for instance, said the lack of discounts as well as reduced advertising were the main factors behind the slowdown in ecommerce sales in the country. "If the GMV (gross merchandise value) slows down, it will have a negative impact on the valuation of these companies. If they give more discounts to get more GMV, the losses will increase further. It's going to be a tough situation to arrive at the right strategy," says Singhal. The companies in question are trying various permutations and combinations to push sales. A larger inventory, more products, exchange offers, faster delivery, better quality as well as loans to the sellers on their platform in order to help them price their products attractively are some of the initiatives taken by these companies to woo customers. "It's all about balancing portfolios between what gives better margins, what really adds to one's top-line and to the bottom-line," says Gogia. Yet, observers feel discounts will continue to be a strategic tool to boost sales. "Amazon doesn't need to worry about valuation or fundraising. Therefore, it would offer the same level of discounting as in the past which will force others to take that route, too," says Singhal, adding that "as there isn't any loyalty associated with any of these marketplaces, buyers would opt for the company that offers products at the cheapest rate. Therefore, even with a not-so-good financial situation, both Flipkart and Snapdeal will have to match Amazon's discounting. They have no choice. If they don't do, they will lose significant market share." For now, all eyes are set on Flipkart's 'Big Billion Day', the iconic sale it runs every year around the festive season, which also accounts for a significant part of its annual GMV. A successful 'Big Billion Day' may flip Flipkart's fortunes but will Amazon sit pretty and let its India rival walk past it?